OK. Maybe Ron Determann’s machete is for whacking rhododendron, pointing out rare plants and plunging handle-deep into mountain bog muck to show how bedrock lying just inches below channels the water that serves as lifeblood for this endangered Southern Appalachian habitat. Or, maybe there’s something to his quip about losing a foot if you step on a rare plant … you know? But what else would you expect from one of Georgia’s bogfathers. 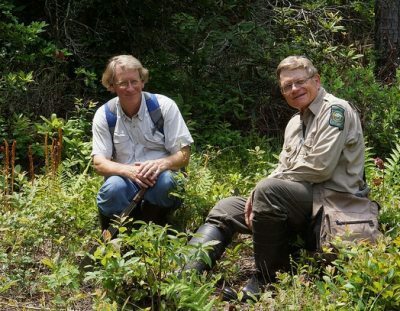 During a recent trip to the Rabun County bog where mountain bog restoration began in Georgia, Determann, vice president of Atlanta Botanical Garden's Fuqua Conservatories, and fellow “bogfather” and veteran DNR botanist Tom Patrick walked members of the Bog Learning Network through a brief conservation story of successes, challenges and at least one misstep. Patrick told how a U.S. Forest Service biologist showed him the Chattahoochee National Forest bog in 1990. The wetland had first been reported in the 1950s. Almost 40 years later, rhododendron and laurel were choking it. But the bog still had montane purple pitcherplants, then one of only two known Georgia sites and the southernmost Appalachian population for the carnivorous plant. 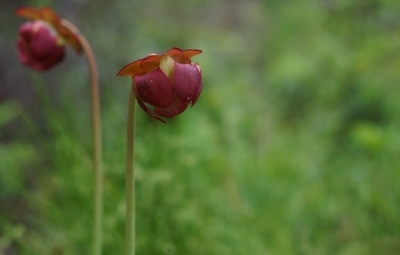 Purple pitcherplant (below) is now a candidate for listing under the Endangered Species Act. The Rabun County plants are important, too, because diverse and unique genetic complements are often found in a species population at the edge of its range. Yet, when Patrick returned to the bog with Determann in fall 1990, they found that a well-intentioned but misguided worker had fertilized most of the pitcherplants, literally loving them to death with doses of 10-10-10. Few plants survived. Unlike most plant species, pitcherplants thrive on nutrient-poor soils. The botanists took 17 small divisions of the existing purple pitcherplants to Atlanta Botanical Garden, and Determann began propagating them. The last-ditch effort succeeded. That work not only led to restoring the bog – more than 200 plants raised from surviving seed have been returned to select pockets of the site – it kick-started collaboration between Atlanta Botanical Garden and DNR to conserve rare native plants, turned attention toward saving mountain bogs in Georgia and blossomed in 1995 into the Georgia Plant Conservation Alliance, a network that has bolstered plant conservation statewide, including at mountain bogs. Atlanta Botanical Garden has since propagated thousands of purple pitcherplants. Nearly 700 have been outplanted into six mountain bogs in north Georgia. The rest are in ex-situ safeguarding greenhouses. The Rabun County bog has thrived from clearing – yes, some by machete – and prescribed fire. The most recent fire, a Forest Service-led burn set by helicopter in February, torched some of the mounds of dead brush taken out in 2010. Hand-set fires in the bog targeted invading plants and trees. 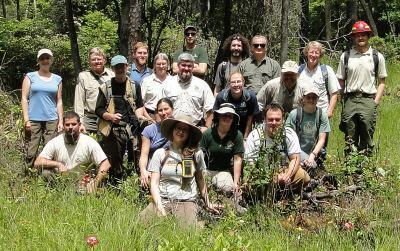 Last month, more than 20 Bog Learning Network members from Tennessee, North Carolina and Georgia carefully picked their way through the bog to see the pitcherplants and other rare plant “goodies” – Patrick’s term – such as Carolina bog (or sheep) laurel and small spreading pogonia. It was part of an educational, two-day meeting near Clayton for managers in the regional group focused on advancing mountain bog stewardship and management. “Just learning about how people have applied fire here is really helpful,” said Sarah Fraser of Carolina Mountain Land Conservancy in Hendersonville, N.C. The threat at the Rabun bog has shifted from encroaching rhododendron and changing hydrology to roaming feral hogs. Thankfully, rooting has taken a downturn since the Forest Service trapped two large sows. But restoration continues at this and other bogs, building on lessons learned at what Determann calls “the little ambassadors” of plant conservation. “I think the success is that at the same time there’s restoration of the habitat … we’re figuring out the microsystems” where the plants grow best, he said. One of the most critically endangered habitats of the Southern Appalachians. The bogs are typically small – from a half-acre to 5 acres – and usually associated with seeps, springs and small creeks. These are early successional habitats that support a variety of unique and imperiled flora and fauna. You’ve probably seen bats feeding around lights in your neighborhood or dipping across a country road in front of your headlights. But are you seeing them as often as you used to years ago? Georgia DNR biologists are concerned that bat populations are declining, especially since white-nose syndrome – a fast-spreading disease fatal to bats – was detected in the state last year ("Bat-killing disease found in Georgia, March 22, 2013). Now, there are two ways you can help monitor bats in your area. The newest project involves counting a bat colony. 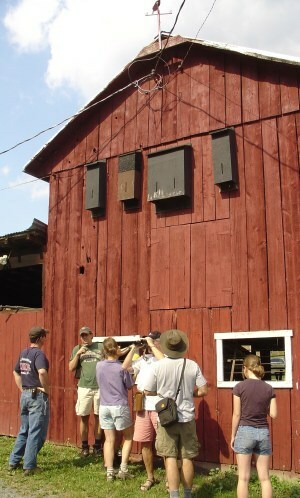 Got bats in a bat house, barn or other structure? Consider doing emergence counts. “Emergence counts are one of the easiest ways to estimate bat numbers at summer roosts,” said wildlife biologist Trina Morris, who studies bats and coordinates monitoring for DNR’s Nongame Conservation Section. Joining in is easy. Simply download these instructions and a form to fill for each count. Morris hopes Georgians statewide will take part. The project mirrors programs in Pennsylvania and Wisconsin. Emergence count surveys rate even more important because of the potential impact of white-nose, which has been documented in 25 states. Also, volunteers are needed to drive routes to record bat calls. DNR’s Anabat program, started in 2012 and based on acoustic transects set up across the state, has been very successful. Volunteers have collected thousands of bat calls. Only a few routes are available (check openings). But biologists plan to add routes, so stayed tuned if nothing is currently open in your area. If you don’t have a bat roost and want to build one, Bat Conservation International offers these instructions. Kits and completed boxes built in Georgia are available at Habitat for Bats. Bats are picky, so make sure you follow the instructions for building and placing a bat box to give you the best chance for attracting bats. Maybe someday soon you’ll be spending some pest-free summer evenings counting your bat colony! Like most backyard wildlife enthusiasts, it seems I’m forever trying to thwart squirrels and housecats from feeding at my bird feeders. Though I really don't mind squirrels dining on seeds from time to time, I have no patience with cats trying to pounce on birds sampling the sunflower and millet seeds. So, often during spring and summer when I hear "meeeow, meeeow" coming from a thick shrub, the first thing that pops into my mind is that a house cat is on the prowl again. 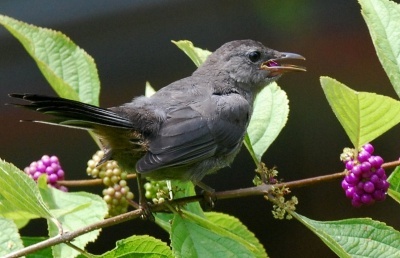 However, more often than not, the critter making the sound is a gray catbird. These birds are honored summer residents in my backyard, and a species aptly named for its color, call and preference for thick habitat – thus the genus name Dumetella, derived from the Latin word for thorny thicket. Read on to learn more about these brush-loving birds, including how to attract them to your yard. Terry W. Johnson is a former Nongame program manager with the Wildlife Resources Division and executive director of TERN, the Nongame Conservation Section’s friends group. “Out my backdoor” archives. Add 1,117 acres to the more than 40-mile-long lineup of conservation lands along the Altamaha River. The Nature Conservancy recently bought the Morgan Lake tract in Long County and sold it at below-market value to DNR for use in the wildlife management area system. The site’s wetland forests include a range of native tree species and habitat for wildlife such as swallow-tailed kites. Morgan Lake is also a critical link between Griffin Ridge WMA and the protected corridor reaching from Townsend WMA to the Altamaha delta. Funds for the purchase came from sources including Nature Conservancy donors, the state, the Knobloch Family Foundation, the U.S. Navy and a U.S. Fish and Wildlife Service National Coastal Wetlands Conservation grant. What's the hottest wildlife plate in Hall County? DNR's bald eagle tag, according to the county tax commissioner. DNR plates actually make up three of the five best-selling specialty plates in Hall. What's even better? 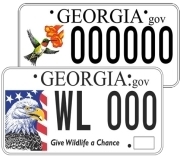 A law change scheduled to take effect July 1 will lower the price of DNR wildlife plates and provide more funding for the conservation work they support. Upgrade your plate! Fourteen nongame projects, varying from teacher camps at Charlie Elliott Wildlife Center to research into golden eagles’ wintering habitat, will receive funding from The Environmental Resources Network. TERN, the Nongame Conservation Section friends group, recently awarded nearly $59,000 in grants to agency staff, increasing to more than $1 million the support TERN has provided over the years. Third- through fifth-grade science teachers can benefit from a continuing TERN grant. The Nongame Conservation Section awards the $1,000 grant to a Georgia public or private school educator who demonstrates exceptional energy and innovation in teaching life sciences. Apply. All Georgia teachers can boost their wildlife knowledge and teaching capabilities at the Outdoor Wildlife Leadership School July 14-18 at Charlie Elliott Wildlife Center near Mansfield. The workshop – a bargain at $100, which covers meals, materials and lodging – will focus on wildlife conservation for K-12 and non-formal educators. The 111 loggerhead sea turtle nests reported in Georgia through May 30 were 65 fewer than during the same period last year, 362 fewer than in 2012 and about half the 10-year average for the month. While prospects of a fourth straight summer of record loggerhead nesting seem slim, May totals vary widely and are not a sound predictor for the season, according to DNR Sea Turtle Program Coordinator Mark Dodd. Update: Total tops 260. The number of sea turtle strandings – dead turtles washing up on the beach – remains low this spring. Dodd writes that the 50 strandings through May 31 are the fewest since at least 2009, and 20 fewer than average – despite what appears to be more shrimp trawling in federal waters. Boating watch. The peregrine falcon fledgling at SunTrust Plaza is flying more – and more proficiently. A falcon fan at McKenna Long & Aldridge recently watched as a parent bird flew by, dropped prey from its talons and the fledgling flew to catch it – part of peregrine flight 101. DNR’s falcon cam is off-line for the season but videos are available. Wet oak flats on the coast are the focus of new Nongame Conservation Section surveys. These habitats, also known as hydric hammocks or nonriverine wet hardwood forests, have received little attention in Georgia, but preliminary results show that some are the most species-diverse habitats in the region. A dozen year-old gopher tortoises have been moved from St. Catherines Island to pens at Yuchi WMA near Waynesboro. 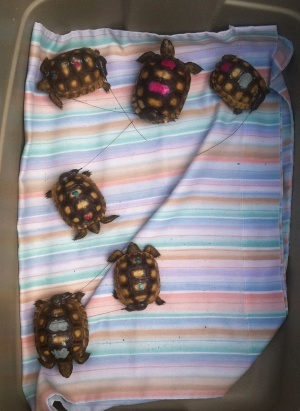 Once acclimated, the tortoises will be released at Yuchi to help build its population – unlike at St. Catherines, where gopher tortoise numbers are at carrying capacity ("Keeping tortoises put," June 29, 2012). The 100 wood duck boxes that DNR’s Game Management Section just bought from the Abraham Baldwin Agricultural College Wildlife Society chapter are a good investment. WMA wood duck nest boxes produced more than 6,000 ducklings in 2013, according to the section’s Waterfowl Program. See a wood duck mega-brood! One of the latest bird apps comes from researchers at Columbia University and the University of Maryland. Birdsnap, free and designed for iPhones, uses computer vision and machine-learning techniques – including face recognition algorithms – to identify 500 of the most common North American bird species. Shooting a red-shouldered hawk in Baxley has a convicted felon facing a handful of charges. In addition to seizing the gun as evidence, DNR Ranger Patrick Gibbs and Baxley police cited the suspect for discharging a firearm inside the city limits, taking a protected species and possession of a firearm by a convicted felon. Law Enforcement Division reports. NOAA's policy of notifying – but not necessarily citing – speeding vessels in protected areas on the East Coast reduced speeds in the areas, protecting endangered North Atlantic right whales while keeping mariner fines to a minimum. A new NOAA-led study found that of the 8,009 vessels that made more than 200,000 trips from November 2008-August 2013, almost all were notified of the limits, 437 received warnings and 26 were cited and fined, with compliance improving steadily through the period. 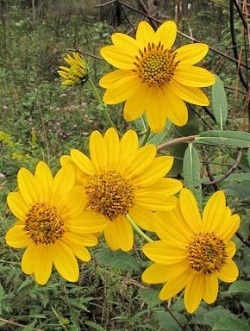 The proposal to list whorled sunflower under the Endangered Species Act has the U.S. Fish and Wildlife Service asking for comments on critical habitat and a draft economic analysis by June 30. The species is found in Georgia’s Floyd County and in Alabama and Tennessee. The Fish and Wildlife Service is working with states, industry, landowners and conservation groups in the Southeast to conserve species and help ensure they don’t need federal listing. New data shows that five crayfish species petitioned for listing, some found in Georgia, do not require that level of protection. The Regional Conservation Partnership Program of the federal Natural Resources Conservation Service will be the focus of online question-and-answers sessions June 11 and 18. Participants are encouraged to download instructions and test their computer before logging in. Names in the news: Dr. Donald Imm is now field supervisor at the Fish and Wildlife Service’s Georgia Ecological Services office in Athens. The New York native formerly worked as project leader at the agency’s Panama City, Fla., field office. Mary Ann Anderson is the Georgia Wildlife Federation’s new communications specialist. The Mercer University (Macon) graduate is a longtime nature writer and photographer. 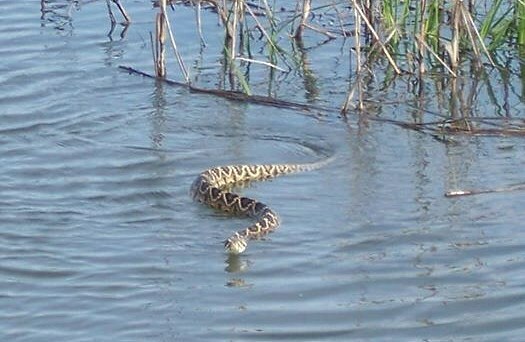 photographed this swimming diamondback near Little Tybee Island in Chatham County last month. More on native snakes? Check out “Amphibians and Reptiles of Georgia” (UGA Press). plus native plants and natural habitats. Georgia Wild copyright © 2014. Wildlife Resources Division Nongame Conservation Section. All rights reserved.